USC Marshall School of Business Professor Leigh Tost and PhD student Stehpanie Smallets presented to Women in Management (WIM) members at the Health Sciences Campus on Tuesday, November 6, 2018. Dr. Tost studies the psychological and sociological dynamics of power and status in organizations, with a particular focus on how hierarchy affects team functioning, moral judgments,and ethical decision making. Ms. Smallets’ research focuses on understanding the predictors of inequality, both psychological and structural, and creating interventions to empower those who are disadvantaged. 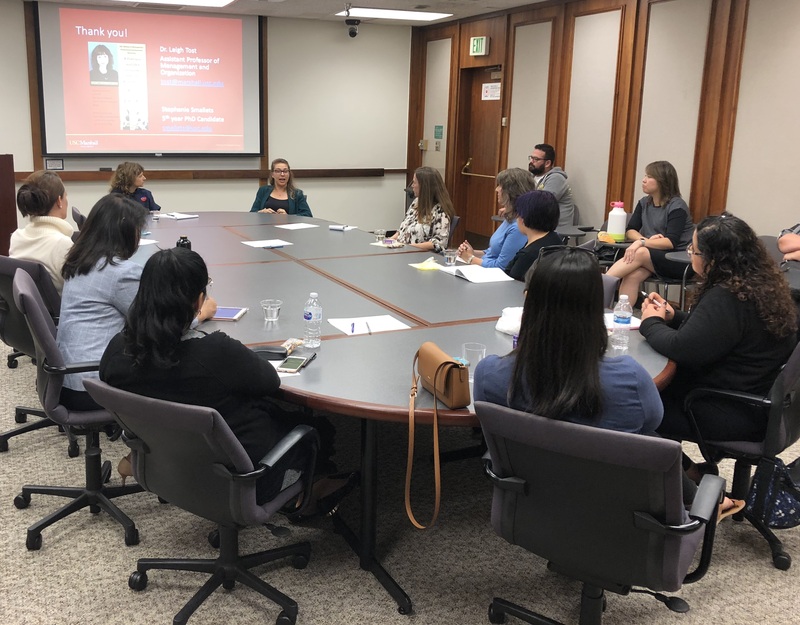 Prior to the event, Dr. Tost and Ms. Smallets surveyed WIM members on their thoughts,concerns, and questions related to gender, diversity, and leadership in the context of career. As part of this professional development workshop, they presented the survey results and also shared additional findings from their research areas. From the 44 WIM survey respondents, the top three areas of concern related to gender equity are the lack of opportunities for promotion, lack of leadership development opportunities and resources, and unequal pay between women and men. Dr. Tost noted that it is important to look at results like these with different filters– such as responses from members that identify as women of color. When analyzed, the top three areas of concern had differed for this smaller group.Dr. Tost and Ms. Smallets also discussed that change in organizations has been shifting from a top down model to bottom up or center out models. In today’s workplace, a group of people, usually middle management or frontline employees,make change by engaging in issue selling or identifying areas for change and then advancing that change. We also discussed equity strategies used by employers – two of which are gender blindness and gender awareness. In addition to learning about their pros and cons, we learned that employers who engage in the gender blind strategy are seen as less open to ideas by employees and employees practice predictive vigilance with their actions. Dr. Tost and Ms. Smallets mentioned that a future study may involve looking at age discrimination and digging deeper into individual perspectives on gender equity. Possibly asking respondents to think about what they see in their organization, what they want in their organization, and what they think about gender equity if that differs from the previous two responses. Members asked questions on how to gather data on gender discrimination and age, if there is university wide training for leadership and/or collaboration with the USC Race and Equity Center, or if they have researched gender equity differences between the faculty and staff population, union and nonunion employees, or the trans community. Previous post: Help Celebrate World Values Day!